Trans Slovenia | Trans Slovenia 03: A variety of trails & breathtaking views. Join us! The Trans Slovenia 03 biking tour is taken from the eastern to western part of Slovenia, along the border with Austria, leading the group across different scenic mountain massifs and through beautiful Alpine valleys. The path, which begins in the second largest Slovenian city of Maribor, ends in Kranjska Gora, a beautiful Alpine village at the foot of the Julian Alps. The tour includes an abundance of various trails running through many different landscapes and offering plenty of breath-taking vistas as well as diverse experiences, including bike trail parks at almost every stage. 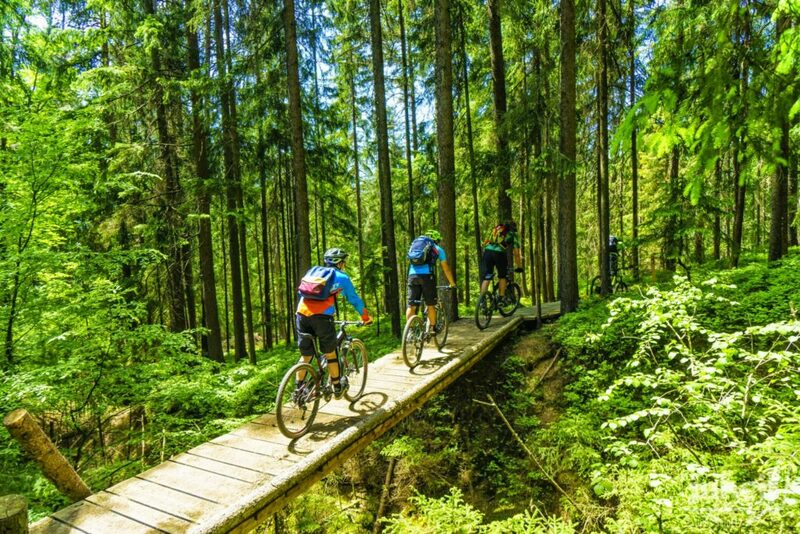 The magical spruce forest trail across Pohorje passes the natural reserve of Črno jezero ( Black Lake), leads over a picturesque grassy reef to the valley of Koroška and to Slovenj Gradec, which is the largest town in the region, and ends at the tracks of the Jamnica Single Trail Park. 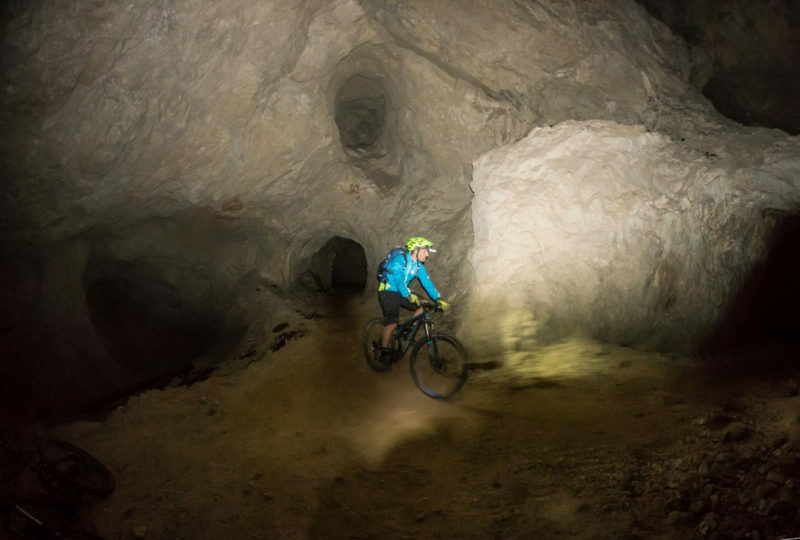 Before ascending to Raduha, which is a mountain in the eastern part of the Kamnik–Savinja Alps, a section of the tour follows an underground trail through the abandoned mine tunnels. The panoramic road leading from Raduha above the famous Logarska dolina valley offers impressive views over the mighty walls of the Kamnik–Savinja Alps. The breath taking mountain scenery surrounds a brief yet steep descent to the Austrian side and an ascent back to the next mountain border pass to reach the high glacier valley of Jezersko. From there, a steep border trail leads into the heart of the Karavanke mountains. The path includes steep climbs on gravel, connecting trails and mountain pastures under Košuta, which is Slovenia’s longest mountain ridge. After a thorough exploration of the Karavanke trails and many beautiful sights, a wonderful view of Lake Bled opens up and makes the last kilometres towards its shore more enjoyable. The last part of the tour leads from the picturesque Radovna Valley to Kranjska gora. Pohorje is a medium-height mountain range situated south of the Drava River in north-eastern Slovenia, with 70% of its surface covered in forest. It measures about 50 km from east to west and 30 km from north to south and represents the main recreational area for various towns in north-eastern Slovenia, each situated at its foot and usually including a ski resort. Maribor is one of the starting points for climbs to Pohorje. An unpaved road leads to the upper station of the Pohorje cable car. Please note that the initial climb can be avoided by using a cable car from the valley. This is where the crossing of the first part of the Pohorje massif, all the way to the Rogla ski centre, starts. The trail passes the Areh and the Ruška koča mountain huts, leading through magical spruce forests to Osankarica and passing the natural reserve of Črno jezero (Black Lake). The level can be adjusted by taking easier connections on the unpaved forest roads. After a rather strenuous first day, the second stage starts in a more relaxed manner. 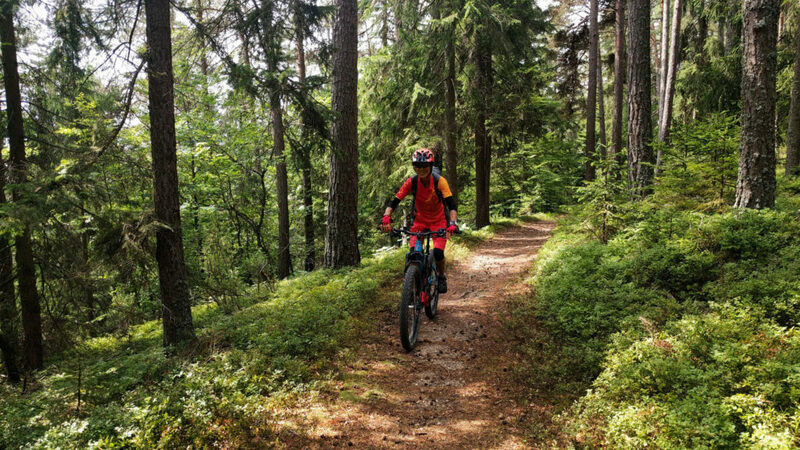 It opens with a comfortable descent along one of the easy paths of the Rogla Cycling Park. The descent along unpaved roads to the Pesnik mountain hut is followed by an ascent to the Ribnica hut. The trail continues to the highest peak of Pohorje, Mount Črni vrh (1543 m), revealing the most beautiful views over the picturesque grassy reef all the way to the Grmovškov dom mountain hut found under Mount Velika Kopa. A beautiful descent then leads deep down into the Mislinja valley, leaving behind the massif of Pohorje. A fast and comfortable section of the cycle track across the valley and through the city of Slovenj Gradec, the unofficial centre of the Slovenian Carinthia, runs almost to Dravograd in the Drava valley. There, the trail turns upwards again, to the slopes of Mount Strojna, with the adventure ending along the tracks of the Jamnica Single Trail Park. The third day of the Trans Slovenia 03 tour begins with taking several single trail paths in the Jamnica Park, which are followed by a descent to the valley. The descent continues beyond the valley, following the underground trail along the abandoned and intriguing tunnels of the Mežica mine under Mount Peca. Accompanied by the guide and properly equipped with flashlights, the transition from one valley to another is a unique experience. Those who dislike closed spaces can take an alternative route. The underground experience is nicely contrasted against the programme prepared for the second half of the day. The partly unpaved road from Črna na Koroškem, which is the birth town of Slovenian ski champion Tina Maze, climbs up to Mount Raduha and eventually transforms into a beautiful panoramic road high above the famous Logarska valley. Impressive views over the mighty peaks of the Kamnik–Savinja Alps are simply unforgettable. The mighty walls of the Kamnik–Savinja Alps greet the tour in the morning with the sight of the picturesque church of Sv. Duh (English name: Holy Ghost). The biking continues along the Solčava panoramic road for some time before a gentle climb is taken to the Pavličevo sedlo mountain pass. From there, an asphalted road runs down the steep slopes on the Austrian side of the mountains, again overlooking the mighty mountain scenery. Right after that follows an ascend to the Jezerski Vrh mountain pass to cross the state border and continue downhill to the high glacier valley of Jezersko. 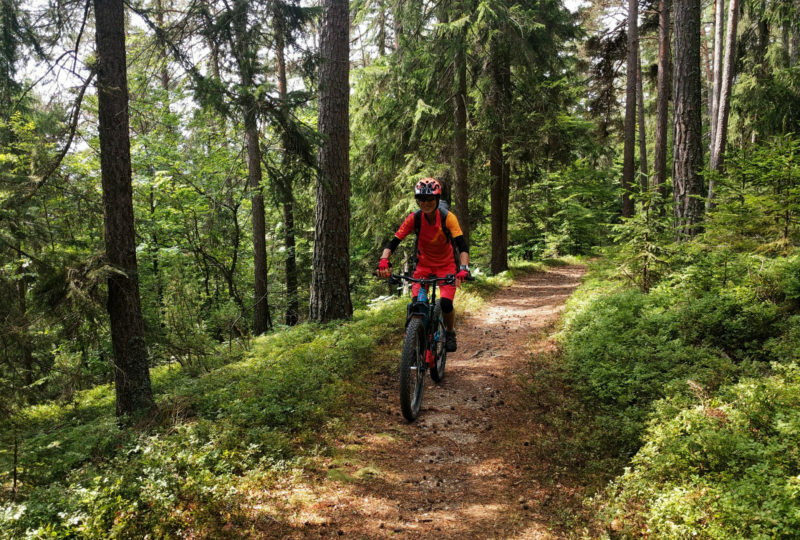 For those who would like to do some more biking, an additional roundabout trip past the Planšarsko jezero lake to the Ravenska Kočna valley might be the right choice. Day 5 of the Trans Slovenia 03 tour is all about adventurous biking into and around the heart of the Karavanke Mountains, including many steep climbs along the unpaved roads connecting trails and mountain pastures below the mighty peaks of Košuta, Slovenia’s longest mountain ridge. The culinary delights served at the Kofce mountain pasture, especially the delicious dumplings, will help the tour members to regain strength. The picturesque pasture offers breath-taking views of the surrounding mountains all the way to Mount Triglav in the Julian Alps as well as the Ljubljana Basin and the Kamnik–Savinja Alps. In the last part of the day, the tour follows the Tržiška Bistrica stream all the way to the valley of the same name. The Dovžan gorge starts right where the stream makes a sharp turn and narrows down into a spectacular gorge. The gorge is so narrow that there is not enough space to build a road, so almost 120 years ago a picturesque tunnel was constructed through which traffic flows to this day. A visit to the gorge is almost like a journey through time. Although it is older than dinosaurs, no dinosaurs ever trod here. However, they did swim nearby as, 300 million years ago, this place was the site of a tropical sea teeming with marine animals. Today the walls of the gorge still hold an abundance of fossilized remains, with some of them found nowhere else in the world but here. The ride of the day finishes in Tržič, a small town under the mountains. The last full day of the tour is all about the mountains. From Tržič, the route climbs the high slopes of Begunjščica, yet another ridged mountain in Karavanke, continues through the village of Podljubelj and goes up a steep hill all the way to the Preval mountain hut. Then follows a descent at the similar level of steepness, again full of stunning views, until the ultimate one opens over the Sava valley and Lake Bled. This descent adds a cherry on top for every eager biker. An overnight stay is organised at Bled. The very last day is concluded with yet another scenic ride. Leaving the unique lake Bled, the route leads through the picturesque Radovna valley to the Mojstrana village. Mojstrana is known for an excellent alpine museum, which is definitely worth a visit. From there, the bicycle path leads to Kranjska Gora, where the Trans Slovenia 03 journey ends, leaving room for the Trans Slovenia 01 tour. 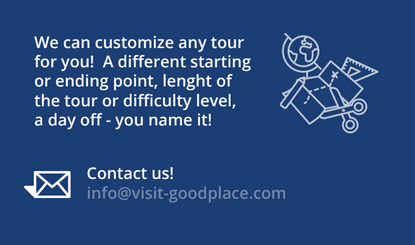 Note: In season, any tour can be organised on any date for a group of a minimum of 2 people. Please contact us for any inquiries. Rates are valid per person, based on double occupancy. 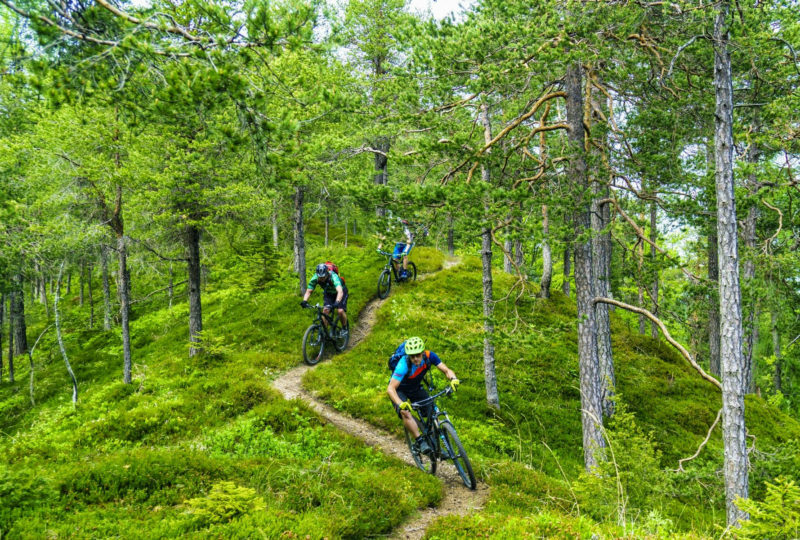 Travel and activity insurance, personal safety & cycling equipment, lunches, all beverages with included meals, any other items not mentioned as included. 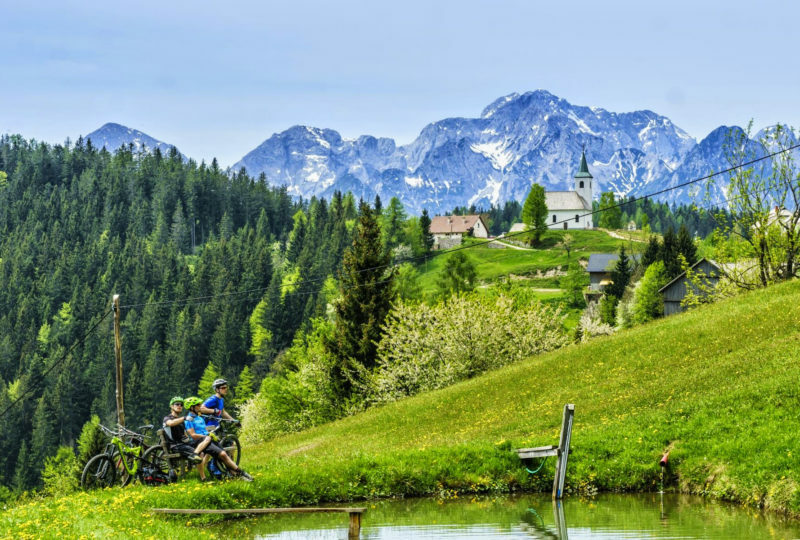 The Trans Slovenia 03 Biking Tour starts in Maribor and ends in Kranjska Gora, near the Slovenian border with Austria and Italy. Three international airports, i.e. those in Ljubljana, Zagreb and Graz, are located an hour’s drive away, and four more, those in Trieste, Klagenfurt, Vienna and Budapest, are found within the 150-minute driving distance. For your convenience, shuttles can be arranged from any of these locations. Secure parking is provided and a transfer from Kranjska gora back to Maribor is organized. Our tours are mostly operated through small towns and villages. We always make effort to select the most authentic and visitor-friendly accommodation and dining arrangements available. This way the tour groups can enjoy local hospitality and great food on the entire route. Every group consists of a maximum of 8 persons. Several groups can share a single tour. The grouping arrangements are based on personal desires, body fitness and the types of bikes. A briefing is organized every evening, where the guide(s) reveal the next day’s tour information, such as the altitudes, length, difficulty etc. There is always an option to avoid difficult route sections or change the group if there is more than one taking the tour. Within a single day, there are usually some alternative trails to allow variations according to the specific requirements of each group. The meeting instructions and final trip arrangements are sent to participants two weeks before the tour start date. Do you wish to receive good news?